One of our treasures is gone! In a great loss for the Burmese, particularly for the women of Burma, Dr. Daw Myint Myint Khin, a well-known doctor, teacher and writer whom many of us fondly and respectfully called “Mummy,” passed away at the age of 91 last week, after receiving treatment for heart and kidney failures. In addition to her work in medicine, she was a pioneering feminist who championed liberty, and whose influence was known at home and abroad. Her accomplishments made me and others feel proud to be Burmese women. Daw Myint Myint Khin was born in Pathein, Irrawaddy Division, and received a bachelor’s of arts degree in Rangoon before pursuing her medical studies in England and the United States. She became a professor and head of department at the Institute of Medicine in Mandalay before taking up a position as a professor of medicine at the National University of Malaysia. Then she served as a consultant at the World Health Organization’s Southeast Asia regional office in New Delhi. She published 11 books, as well as her first poetry book, “Poetry for Me,” at the age off 88.
mismanagement of our country, we are in this position. If we were given half the chances that you get, we would achieve twice as much. Don’t tell me, we speak English—of course we speak English! You Singaporeans speak only Singlish. We speak the Queen’s English.” The astonished driver looked at her in his rearview mirror and said nothing more. In December 2012, I had an opportunity to join Australian Women Leaders’ Delegation to Myanmar, made up of 16 prominent women from Australia, the United States and East Timor. The group, ranging from age 21 to 69, included parliamentarians, academics, bankers and practitioners from development sectors. Hoping to show the delegation what it’s like to be a woman in Burma, I organized meetings with Burmese women’s organizations and women leaders. Among them was Dr. Daw Myint Myint Khin, who, once again, proved to be strong and spontaneous. The delegation was impressed by what she had done and continued to do. At the age of 90, she was continuing to organize care for “older” professional doctors (many of whom were surely younger than she was). After the meeting, the delegation continued to talk about her, fondly referring to her as Mummy. The delegation members were so inspired by her and were encouraged to boost their collaboration with other Burmese women’s leaders. One said; “Burmese women are truly natural leaders, very able and very strong. We would be so honored to work with them.” Today their organizations are working with different women’s organizations in Burma to empower women. The loss of Daw Myint Myint Khin is incalculable. By example, she showed us what a Burmese woman can do for her country and people. Her life is a reminder of how much our culture and our positions have declined over the decades. Today Burmese women’s participation is sidelined, our decision-making is denied, our capacities are marginalized and even our hearts are subject to discipline and punishment. Our matrilocal culture has been reduced to nothing in the name of race, religion, and sovereignty. Mummy, a towering figure, will inspire us to fight for the rights and freedoms we once enjoyed in our traditional culture, for the liberties that were so envied by our sisters in the West. Her name may not be included in any official his-tory, but she has written HER-STORY, which will be kept in our memory. 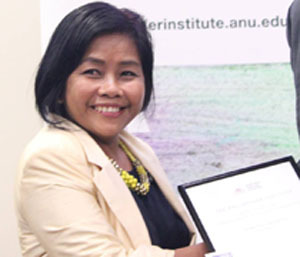 Dr. Ma Khin Mar Mar Kyi is an award winning social anthropologist and gender specialist at the University of Oxford. She previously worked as a lecturer at the Australian National University and a senior adviser for the Australian government, universities and INGOs. She is the director of an acclaimed film “Dreams of Dutiful Daughters.” Currently she is working as a senior adviser in Burma.